It’s hard to pick a favorite summer supper…but this one might be it. Naoto and I have been making this for years and it’s become our go-to recipe for guests because it’s no stress and it’s always a crowd pleaser. While the chicken is roasting and the water is coming to a boil, make the sauce: whisk the olive oil, lemon juice and grated parmesan in a large serving bowl. Set aside. When the chicken is done, slice it into bite sized pieces and add it to the serving bowl. Boil the angel hair until it’s al dente. Drain the pasta, but reserve a cup of the pasta water for later (just in case). 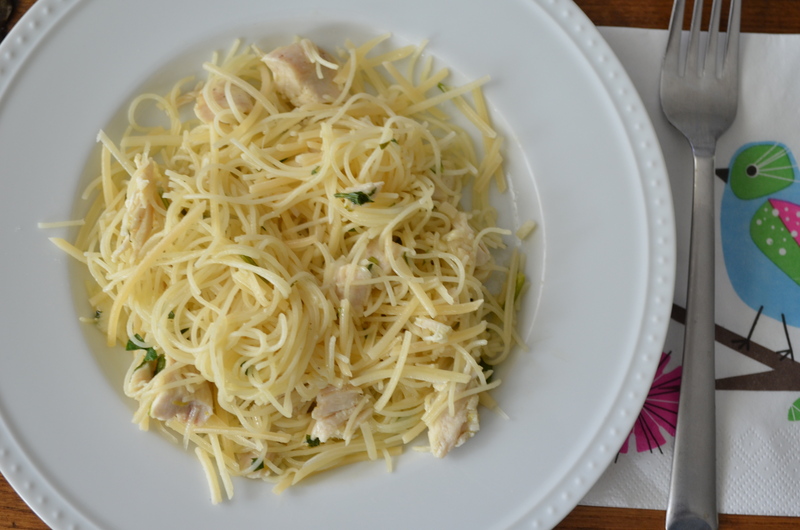 Toss the pasta and the chicken in the lemon sauce. If the mixture seems dry, add a little bit of the cooking liquid to loosen things up. Once everything is mixed in well, add the chopped parsley and lemon zest for garnish. Mmmm this sounds perfect for tomorrows dinner! I can’t wait to try it, thank for sharing with us!! Hi Julie! I hope you like the recipe and it helps you use up those lemons–so jealous of your lemon tree!! I pinned the recipe, so you can find it here if you’d like: http://pinterest.com/pin/121175046196959237/ I need to create a pin button…one of these days!